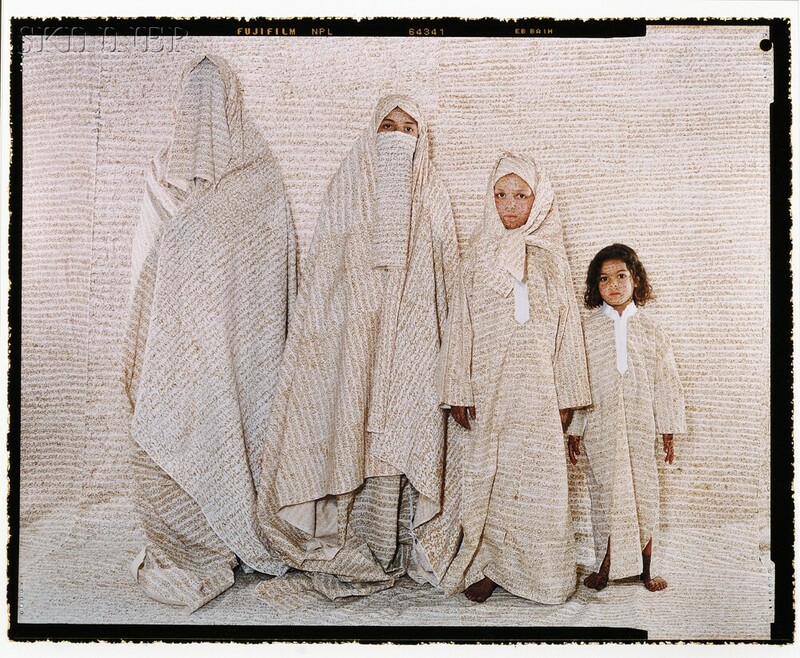 She Who Tells a Story and the Photography of Lalla Essaydi | Skinner Inc.
One of the artists featured in the show is Moroccan-born Lalla Essaydi. Lalla grew up in Morocco and then Saudi Arabia, so her perspective is very much that of a woman from the Arab world. But Essaydi earned her MFA from the School of the Museum of Fine Arts, Boston, in 2003, and currently resides in New York City, so her viewpoint is equally Western. This dichotomy is clearly expressed in her subjects. In her Converging Territories series, the artist presents female figures that float in a soft white world and are overwritten with Arabic calligraphy. Western interest in the figure, and the Middle Eastern penchant for artful calligraphy to express the sacred, combine to create powerful images of women whose identities are pulled and pushed into cultural norms that are often at odds with each other. Essaydi’s women are sequestered into cloistered, interior spaces – the realm of women; in many Middle Eastern cultures women are not allowed out of doors unaccompanied by male family members. In Islam, sacred calligraphy is generally limited to the male world so the fact that it covers and surrounds these women both indicates the dominance of the male and associates the women with a spiritual strength and integrity with just a hint of subversion. Skinner is proud to offer Converging Territories # 30 in our September 20, 2013 auction. In this work from the series the figures are arranged from the oldest, who is completely covered and nearly invisible to us, to increasingly younger. As the women become younger, we see more of their faces and bodies, as is customary in many Middle Eastern cultures. The three younger women each look at us directly, and as their ages decrease, their expressions seem more emboldened. Is this a sign of changing attitudes, or is Essaydi simply using the forms of dress appropriate for different ages? We invite you to come and examine the photograph to form your own ideas. Previews for the auction are free and open to the public on Wednesday, September 18, 12-5PM and Thursday, September 19, 12-8PM. We also hope you’ll have the opportunity to view Essaydi’s work in the larger context of the show at the Museum of Fine Arts. This entry was posted in Blog and tagged Arab world, Arabic calligraphy, boston, Islam, Lalla Essaydi, middle eastern art, middle eastern culture, Museum of Fine Arts, photographers, Photography, she who tells a story, Western world, women artists, women in art by Robin Starr. Bookmark the permalink.